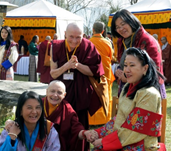 Due to an overwhelming response to attend the 16th Sakyadhita International Conference for Women in Buddhism, we have had to CLOSE REGISTRATIONS. Sakyadhita wishes to advise that there are very limited funds for Sponsorship to attend the Conference. We will endeavor to assist as many as possible, but please consider other ways to raise funds to attend. Please email us on info@sakyadhita2019.org.au and request a Sponsorship Request Form and return to us. The Conference Planning Committee will evaluate your application and notify you as soon as a decision is made. By registering to attend the 16th Sakyadhita Conference, you grant the organisers permission to photograph/video record you during the Conference activities to support promotion, publicity and reporting of the event, future Conferences and Sakyadhita International activities. If you have any objection to being photographed or filmed during the Conference, please speak to one of the staff members or volunteers, who will be located at the registration desk during the Conference. The Conference Planning Committee reserves the right to alter, amend or cancel all or any of the arrangements contained in the program. It is a condition of acceptance of registration that an administration cancellation fee of AUD$50 will be incurred for any cancellations received in writing prior to Friday 31st May 2019. Any cancellations after Friday 31st May 2019 will forfeit 100% of the registration fee. A substitute attendee may be nominated by you, prior to the Conference start date of 23rd June 2019. Please note: Registration fees do not include insurance of any kind. It is strongly recommended that at the time you register for the Conference and book your travel, you take out an insurance policy of your choice. The policy should include loss of fees/deposit through cancellation of your participation in the Conference, or through cancellation of the Conference, loss of international/domestic air fares through cancellation for any reason, loss of tour monies through cancellation for any reason including airline or related services strikes within Australia, failure to utilise tours or pre booked arrangements due to airline delay, Force Majeure or any other reason, medical expenses (including sickness and accident cover), loss or damage to personal property, additional expenses and repatriation should travel arrangements have to be altered. The Conference Planning Committee cannot take any responsibility for any participant failing to arrange their own insurance. This insurance is to be purchased in your country of origin.